The Fisher Boekel Ocelot Orbital Shaker provides variable rotation and a gentle tilt degree in an easy to use, reliable instrument. 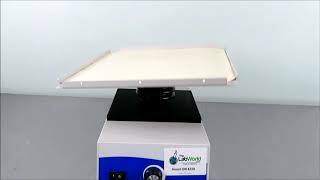 This plate rotator has gentle speed range of between 6 to 125 rpm with a slow start to minimize splashing, combined with a tilt angle for a gentle wave like action to help stir and agitate microplates, petri dishes, and other low lab glassware held in place by a 12 x 12 nonskid, white silicone mat. This Fisher Boekel Ocelot Orbital Shaker has been fully inspected and operated without issue. All of our lab equipment comes backed with our standard warranty. Should you have any questions, please don't hesitate to contact us.